It's Like Trying to Pull Air Through a Flattened Straw - Is Your Dog at Risk? "Trachea" is the scientific name for the windpipe, which is a tube that connects your dog's nose, mouth, and throat to her lungs. When a dog inhales, the diaphragm (the flat muscle that separates the abdomen and the chest cavity) flattens and the muscles between the ribs move to pull air into the lungs. When the dog exhales, the muscles move in the opposite direction to push air out of the lungs. 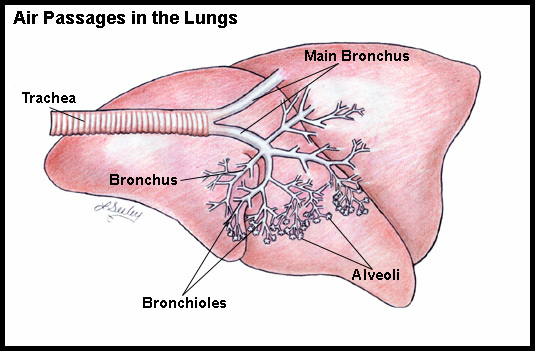 The trachea facilitates the movement of air into and out of the lungs. A portion of the trachea is in the throat, and a portion extends into the chest. The organ somewhat resembles a vacuum cleaner hose. It's made of muscle connected by small rings of cartilage that keep the tube open. The rings are C-shaped, with the open part of the "C" facing upward toward the animal's back. Running along the top opening of the C-rings is a band of tissue called the dorsal tracheal ligament, also referred to as the tracheal membrane or the dorsal membrane. The C-rings that give the windpipe its cylindrical shape can weaken over time, changing from a C-shape to more of a U-shape. In some dogs, the rings of cartilage are misshapen at birth. When the condition is present from birth (congenital), it's likely the result of an inherited deficiency in certain components of the cartilage rings, like calcium, chondroitin, glycoproteins and glycosaminoglycans. If you are buying a puppy that has a breed predisposition to this disorder, it's worth asking about, as more and more breeders are choosing to not breed dogs with this syndrome, a very wise idea. Acquired tracheal collapse (not present at birth) is often caused by chronic respiratory disease, Cushing's disease, or heart disease. Whether congenital or acquired, the weakened C-rings characteristic of tracheal collapse cause the ligament along the top of the windpipe to loosen. So instead of a tight canopy-like structure running along the top of the trachea, the membrane becomes flimsy and floppy. The trachea can collapse along its entire length, or only in the portion that resides in the chest, or only in the portion that resides in the throat. 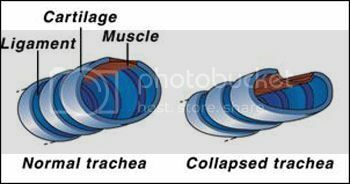 Most often, the collapse is worst in the area where the trachea enters the chest. When a dog with a collapsing trachea inhales and air is pulled into the chest through the trachea, if the weakened C-rings are in the chest area, the limp membrane balloons outward. During exhalation, the membrane deflates and drops down onto the C-rings. If the trachea's weakest C-rings are higher up in the throat area, the opposite occurs – deflation of the membrane occurs during inhalation, and the ballooning during exhalation. As the dorsal membrane continues to distend and deflate, the cartilage rings get progressively flatter until eventually the trachea collapses, leaving the dog trying to pull air through what is essentially a closed straw. Panting or rapid breathing makes the collapse worse, which unfortunately leads to more rapid breathing as the dog's anxiety increases. The condition also creates inflammation in the trachea, which over time causes tissues to change and lose their normal characteristics, further aggravating the condition. Tracheal collapse is by far most common in toy breed dogs, especially toy Poodles, Yorkshire Terriers, and Pomeranians. The condition typically becomes a problem when a dog reaches middle age, but can occur at any age. One of the first signs of tracheal collapse can be a sudden attack of dry coughing that sounds a little bit like a goose honk. It progresses from the goose honk sound to a more consistent cough and often occurs when there's pressure placed on the dog's trachea. This can happen when the dog is picked up or if the collar is pulled. As the disease progresses, the dog can develop exercise intolerance, obvious respiratory distress, and gagging while eating or drinking. Some dogs with tracheal collapse turn blue when they are excited or stressed, and secondary heart disease can result from constantly straining to breathe. Some dogs have both laryngeal paralysis and tracheal collapse. These dogs usually make a wheezing sound when they breathe in. Tracheal collapse can sometimes be seen on a regular X-ray as a narrowing of the tracheal lumen, or opening. Fluoroscopy, which is a moving X-ray, allows your veterinarian to visualize your dog's trachea as he breathes in and out. An endoscopy allows a view of the inside of trachea with a tiny camera. It provides the best way of viewing the inside of the airway. During this procedure, the veterinarian can also take samples of the trachea for culture and sensitivity tests or additional analysis. Sometimes an echocardiogram is recommended to evaluate heart function. Any disease of the upper or lower airway can be mistaken for tracheal collapse, including a foreign object in the airway, laryngeal paralysis, an elongated soft palate, infection of the trachea, lungs, or heart failure, as well as tumors or polyps. It's very important that you get a definitive diagnosis and not just a guess. Conventional medical management of mild to moderate cases of tracheal collapse involves the use of cough suppressants, antispasmodics, bronchodilators, and sedatives to help reduce coughing spasms and the associated anxiety. It's important to break the coughing cycle, because coughing irritates the airway and leads to more coughing. The earlier you intervene with natural cough remedies (including adding cool tea tinctures of slippery elm, licorice root, mullein, wild cherry bark and organic honey to your dog's food), the better. If a secondary factor (see above list) is triggering or exacerbating a collapsed trachea, often resolving that issue (treating a respiratory infection, for example, or getting your dog's weight under control) will also resolve the symptoms of the collapsed trachea. I also recommend you evaluate your dog's environment. It should be smoke-free and free of other environmental pollutants. Get rid of the PBDE-sprayed dog beds from China and invest in an all-natural new bed, switch to organic household cleaners, ditch the room sprays and plug-ins, and get a new air purifier. Any dog with a collapsing trachea should be walked using a harness only. I absolutely do not recommend anything around the neck, as reducing all pressure at the throat is really important for these dogs. I believe traditional collars can dramatically exacerbate this condition by applying traumatic pressure to the trachea for dogs that pull on their leashes. Medical management and/or resolving secondary factors works for about 70 percent of dogs with mild tracheal collapse. Holistic veterinarians usually recommend cartilage builders to help maintain the integrity of the tracheal cartilage. These supplements include glucosamine, Perna mussel (green lipped clam), chondroitin, MSM (an important source of sulphur for healthy cartilage resiliency), eggshell membrane, and CMO (cetyl myristoleate). Many dogs also benefit from organic trace mineral supplementation or whole food sources of silica, manganese, and magnesium, as well as supplemental vitamin C. Natural anti-inflammatories, such as proteolytic enzymes and turmeric can also be beneficial. In some dogs, chiropractic treatments and acupuncture have helped reduce the intensity and duration of coughing episodes, and both homeopathy and Chinese medicine may really help with this condition as well. Surgery is reserved for the most severe cases of tracheal collapse, or for dogs who don't respond to medical management. If the collapse is happening in the neck or the thoracic inlet, plastic rings are placed surgically around the inside of the trachea. If the collapse is deeper in the chest, often a stent is placed in the trachea. A stent is like a tiny spring that holds the trachea open. Stent placement achieves improvement in clinical signs in the majority of dogs, but unfortunately, complications are common within a few years and may require placement of a second stent. Repair of a tracheal collapse is a very specialized surgical procedure with significant potential for complications. These procedures should only be performed by a veterinary surgeon with extensive knowledge and a well-equipped hospital with a staff able to help your dog recover in an appropriate manner. I recommend avoiding this surgery unless you have exhausted all forms of therapy and your dog's ability to move oxygen is affected, potentially becoming a life threatening situation (thankfully, these cases are rare). A study published in the Journal of Veterinary Internal Medicine suggests that liver disease may go hand-in-hand with a collapsing trachea1 Researchers looked at 26 dogs with tracheal collapse, and compared their liver function tests with those of 42 dogs with normal tracheas. The vast majority of dogs with tracheal collapse – 92 percent – had abnormal liver function test results. When some of those dogs received tracheal stents to alleviate symptoms, their liver test results improved. The researchers concluded that oxygen deprivation from a collapsing trachea can result in significant liver disease, and that liver function should be routinely assessed in dogs with tracheal collapse or another severe respiratory disease. Tracheal collapse can be a very frightening and frustrating disease for dog parents. Dogs whose conditions can be successfully medically managed have a good prognosis and a normal quality of life. The outlook for dogs with severe disease or who undergo stent placement is less optimistic. If your dog has a collapsing trachea, her distress can become so severe that normally pink, healthy looking mucous membranes turn a bluish color and she can collapse. If your dog is in extreme distress or collapses, it's a medical emergency. She should be taken immediately to your veterinarian or an emergency animal hospital.